Understanding solar variability is critical to integration of solar energy in the grid system; overestimating variability can unnecessarily limit PV penetration, while underestimating can increase costs or cause issues in grid operation. Due in large part to the high cost of pyranometers (irradiance sensors) and data integration, solar variability is currently measured only at a few select locations. 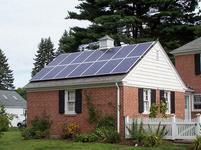 This leaves grid operators in many locations with little or no data about solar variability. Sandia is addressing these issues by developing a solar variability sensor that is inexpensive, easy to install and network, and requires no maintenance during the operating year. The sensor is also battery powered and offers wireless communication capabilities for data transmission. The goal is to encourage ubiquitous solar variability measurements by making such measurements easy and cost-effective, while enhancing the role solar can play in electric grid operation. The lab’s “alpha” stage prototype (shown in photo) confirmed the ability of low-cost components to measure solar variability. A “beta” sensor is now being deployed for testing in three different locations so researchers can further investigate the use and effectiveness of the technology. Researchers from Sandia will give a plenary talk on energy storage test protocols at the European PV Solar Energy Conference (EU PVSEC), to be held in September in Hamburg, Germany. Plenary presentations are given to the entire conference and reserved for outstanding papers which are seen as visionary in the field. In 2014, the conference hosted an audience of approximately 3,000 professionals from 76 countries. In the plenary, researchers will discuss efforts to standardize interoperability certification protocols to validate Distributed Energy Resource (DER) operation and communication within the power system. These protocols will provide for evaluation of energy storage interoperability and functionality, providing frequency and voltage stability of DER in bulk and local power systems. The research is being conducted by Sandia and its collaborators in the Smart Grid International Research Facility Network (SIRFN)— Austrian Institute of Technology, Ricerca sul Sistema Energetico in Italy, and the National Institute of Advanced Industrial Science and Technology's Fukushima Renewable Energy Institute in Japan. The associated conference paper discusses advanced energy storage requirements in each SIRFN country as well as the development of harmonized interoperable storage testing procedures, and presents experimental results from the laboratories. Members of the associated research team also co-authored an article about similar work for PV inverters in the March/April 2015 issue of IEEE Power & Energy Magazine. In June, concentrating solar power researchers at Sandia’s National Solar Thermal Test Facility lifted the lab’s prototype falling particle receiver to the top of the tower. The receiver drops ceramic particles through a beam of concentrated sunlight, which heats the particles to temperatures of at least 700 degrees Celsius. The particles are then stored in an insulated tank, providing energy to the concentrating solar power system as needed. The receiver’s ability to withstand high temperatures means less storage material is required and more energy is available, thus reducing cost while increasing efficiency. Conventional receiver technologies are currently limited to temperatures of about 600 degrees Celsius. Sandia tested the receiver on-ground in March. On-tower testing will be conducted in two phases, which are discussed in more detail in a Sandia News Release. The release also includes a video of the system. The project is funded by the U.S. Department of Energy’s SunShot Initiative and is a collaborative effort of Sandia, the Georgia Institute of Technology, Bucknell University, King Saud University in Saudi Arabia, and the German Aerospace Center. The testing was highlighted by a variety of news sources, including Solar Industry Mag, Energy Business Review, and CSP World. Sandia solar researcher Kenneth Armijo is featured in a new edition of the New Mexico Public Broadcasting Service’s (NMPBS’) “Why I became a scientist,” on NMPBS’ Science Central website. In the video, Armijo discusses how his inquisitive nature led to a career in science and gives viewers a glimpse inside his average day at Sandia. He advises students interested in science to, “always be willing to answer the question, ‘Why?’” A Ph.D. in mechanical engineering, Armijo currently works in the National Solar Thermal Test Facility at Sandia. His research includes work in inverter/power electronics reliability research, arc fault plasma reliability physics, thermal phenomena of photovoltaic (PV) technologies, and other topics aimed at advancing solar technologies. “Why I became a scientist” features video interviews with inspiring scientists, aimed at getting middle and high school students interested in math and science careers. Session descriptions and registration are now available for the 4th PV Performance Modeling Workshop in Cologne, Germany, October 22–23, 2015. Sandia is partnering with TUV Rheinland and the International Energy Agency’s Photovoltaic Power Systems Programme Task 13 to host the workshop, which will convene solar photovoltaic (PV) professionals and researchers to discuss critical, innovative technical issues related to PV performance modeling. Sessions for the 2015 workshop include solar resource data and uncertainty; soiling models; spectral corrections; bifacial PV performance array modeling; updates about modeling tools; and field modeling and validation of PV performance models. Registration is 300EUR (including VAT). More than 15 Sandia solar researchers attended the 42nd IEEE Photovoltaic Specialists Conference (PVSC) in New Orleans, LA, in June. Through plenary presentations and poster sessions, Sandians detailed the lab’s research in PV-related topics including grounding and arc faults, advanced inverters, micro-scale PV, power simulations, accelerated life testing, PV-induced low voltage, islanding, and reliability. PVSC convenes PV researchers, students, scientists, engineers, technology and business leaders, academia, and government for collaboration and knowledge sharing. The 43rd PVSC is scheduled for June 6-10, 2016, in Portland, Oregon. Five members of Sandia’s concentrating solar power (CSP) team presented at The American Society of Mechanical Engineers’ (ASME’s) 2015 Power Conference, held June 28–July 2 in San Diego, CA. The team highlighted research in numerous areas, including characterization of particle flow in a free-falling solar particle receiver, structural analysis of a direct tubular solar receiver for supercritical CO2 Brayton cycle, design and characterization of a 1,000-sun low-cost solar simulator, effects of photovoltaic surface texturing on transmittance and glint/glare, and optical-thermal-fluid Modeling of a tubular solar receiver for supercritical CO2 Brayton cycle. The Power Conference is part of ASME’s Power & Energy series, which convenes more than 1,000 attendees at four power- and energy-related conferences in one location. As part of the Western Electricity Coordinating Council’s (WECC’s) Modeling and Validation Work Group, Sandia researcher Ryan Elliott recently contributed to an update to WECC’s Central Station Photovoltaic Power Plant Model Validation Guideline. The document provides photovoltaic (PV) plant owners and transmission planners with best practices for model validation of utility-scale PV systems connected to the transmission network The procedures outlined in the document are designed to assist stakeholders with compliance of NERC MOD standards. The guideline includes power flow and dynamic data sets for bulk system studies of central station PV plants. Precursor Report of Data Needs and Recommended Practices for PV Plant Availability, Operations and Maintenance Reporting, R. Hill, G.T. Klise, and John R. Balfour (High Performance PV). Arc-Fault Unwanted Tripping Survey with UL 1699B-Listed Products, J. Johnson, K.M. Armijo, M. Avrutsky (Tigo Energy), D. Eizips (Tigo Energy), S. Kondrashov (Tigo Energy), IEEE Photovoltaics Specialists Conference, June 2015. Structured optimization for parameter selection of frequency-watt grid support functions for wide-area damping, J. Neely, J. Johnson, R. Bryne, R.T. Elliott, International Journal of Distributed Energy Resources and Smart Grids, DERlab/SIRFN Special Issue on Pre-standardisation Activities in Grid Integration of DER, vol. 11, no. 1, pp. 69-94, 2015. Predicting the spectral effect of soils on high concentrating photovoltaic systems, P.D. Burton, B.H. King, D. Riley, Solar Energy, Volume 112, February 2015, Pages 469–474. Evaluation of Global Horizontal Irradiance to Plane of Array Irradiance Models at Locations across the United States, M. Lave, W.Hayes, A. Pohl, C.W. Hansen, IEEE Journal of Photovoltaics, Vol. 5, No. 2, February 2015. A Performance Model for Photovoltaic Modules with Integrated Microinverters, D.M. Riley, C.W. Hansen, M. Farr.